Longacre Square didn’t become Times Square without the Astor family making a lot of money. Much of the area had been farmland that had been purchased by John Jacob Astor in the 1830s. Later members of the family were not merely content to be landlords. 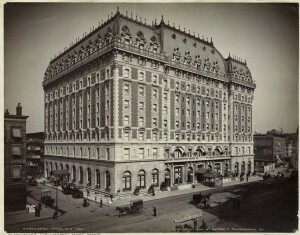 In fact, the great family feud of the Astors and the Waldorfs brought the area its first two luxury hotels. William Waldorf and his cousin John Jacob Astor IV were famously at odds with each other, but their disagreements produced a few striking landmarks. 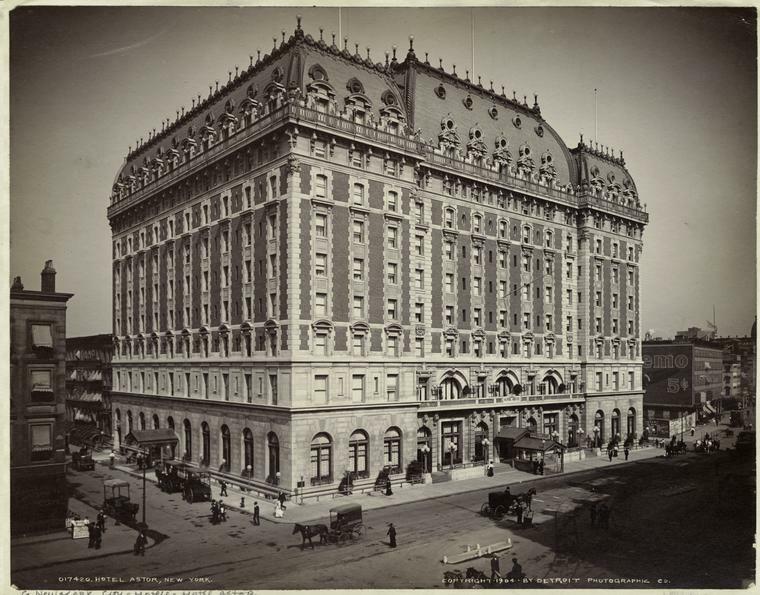 When Waldorf built a hotel next to the home of his old aunt, Caroline Webster Schermerhorn Astor, her son John moved her uptown and built an even bigger hotel. Voila! The two became one, the original Waldorf-Astoria on 34th Street. A lesser known manifestation of this real estate feud waged in Times Square. Waldorf would build a spin-off of the Waldorf-Astoria at Broadway and 44th Street, an area once considered too far west for a luxury hotel. However, with the imminent arrival of a major subway station and a host of theaters, the time had arrived. The Hotel Astor was the brainchild of German businessman William C. Muschenheim, a restaurateur and former proprietor of the New York Athletic Club. Muschenheim’s great dream was to build a hotel. Although planning one at Longacre Square seemed like a risk, it was Astor family property, and the Astors were known for their successful hotels. With backing from William Waldorf, Muschenheim oversaw the construction of the Hotel Astor, an eleven-floor Beaux-Arts jewel stylistically related to the Waldorf-Astoria. When it opened on September 9, 1904, it seemed the gamble had paid off. Its lush ballrooms, lounges and restaurants would host the biggest soirees of Times Square’s inaugural year. A year later, its sumptuous roof garden would open, providing one of the most romantic views of the city. John Jacob Astor IV would not be outdone by his cousin. He would soon take over a hotel project that was being constructed on the other side of the Times Building, at the southeast corner of Broadway and 42nd Street. His Hotel Knickerbocker would open in 1906. But John Jacob, who would perish on the Titanic in 1912, would have the last laugh. The Knickerbocker still sits in Times Square today, no longer a hotel but graced with a Gap clothing store on its ground floor. The Hotel Astor would vanish in 1967, to be replaced with the office tower known as One Astor Plaza today — the home of Viacom and The Lion King (in the third floor Minskoff Theatre). The scene so far: The Packard Motor Car store (which I wrote about Monday) is on the left. The new offices of the New York Times are in the middle. The Hotel Astor is at right. The photographer of this scene has his back facing the Trimble Whiskey written about yesterday.